Posted on Thu, Jan 26, 2012 : 2:46 p.m. Suddenly she covered her mouth with her hand when she realized what she had said and to whom she was speaking to. The look of horror on the woman’s face was akin to letting that really bad word slip while asking grandma to pass the gravy at Sunday dinner. The woman apologized to the man who just giggled and grinned. The owner of the gym was none other than my old pal and police academy mate, “Spanky.” Spanky served with honor at the Washtenaw County Sheriff’s Office. Most of his fine career was spent as a detective. Spanky and I remained close throughout our careers and retired within months of each other. 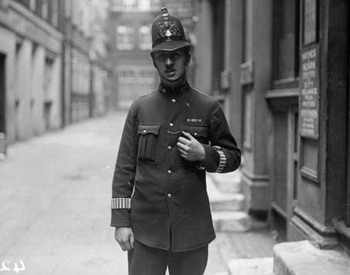 One origin of the term cop is from the British Bobbies, who would shorthand Constable On Patrol in reports as COP. Spanky grinned at the embarrassed gymnastics mom and explained that the term “cop” is not derogatory unless there are vulgar adjectives preceding it or obscene nouns following it. Within moments Spanky was blowing up my cell phone asking me to explain in a column where the term “cop” originated. The term cop has at several possible origins. The most commonly accepted comes from the beginning of organized “modern” police departments. In jolly old England in 1829, Sir Robert Peel established the London Metropolitan Police Force. Sir Robert was a very forward thinking chap. He reasoned that the police should treat the community they serve with dignity and respect to gain the citizen’s support. A community that respected the police would more readily conform to the laws of the land. Sir Robert also emphasized crime prevention and not just apprehension of criminals after a criminal act. Peel’s officers would operate on a “paramilitary” model where there would be a chain of command and officers would wear uniforms that made them immediately identifiable to the public. To weed out the bullies, dullards, laggards and the like from his police force, Sir Robert established a probationary period for all officers hired. All of these splendid tenets are still in operation today at most regular and well-governed police departments. Sir Robert Peel is held in such high esteem that to this day officers of the London Metropolitan Police Department are still referred to as “bobbies” in his honor. In Sir Robert’s police department, as in all subsequent police departments, it was necessary to report an officer’s actions on a daily basis. Today we use computers -- with computer programs that officers swear at with great frequency -- to report the officer’s actions and crimes they have investigated. Police officers throughout history were always looking for a more efficient ways to type or handwrite their reports. For that reason they make healthy use of acronyms. Some examples are: TOT= “turned over to”, DOB= “date of birth,” BOL or BOLO= “be on the lookout,” AKA= “also known as,” and TX.= “telephone,” to name just a few. Sir Robert’s bobbies, who were known formally as “constables,” were no exception. The bobbies were asked to sign each of their blotter entries with name and rank. For patrol officers, they were supposed to sign their name and “Constable on Patrol.” To shorten the last laborious task of reporting one’s actions from the preceding shift, the bobbies shortened “Constable on Patrol” to C.O.P. This is the most commonly accepted origin of the term cop. A more American version of the origin of COP comes from the New York Police Department, NYPD. Their version of the term cop comes from the copper badge that very early NYPD officers wore to distinguish themselves to the public as police officers. The term “coppers” was still used in 1930’s movies starring the likes of James Cagney and Edward G. Robinson. There are other possible origins of the term such as cop meaning to “nab” a criminal. The most accepted versions in law enforcement training are the bobbies signing C.O.P. or the copper badges of the NYPD of old. The modern use of the term C.O.P. originated at Michigan State University and the late Dr. Robert Trojanowicz’s theory on “Community Policing.” In the late 1980s or early 1990s community policing started to be known as “Community Oriented Policing” or C.O.P. Usually when Community Oriented Policing is discussed however it is pronounced C-O-P unless it is plural then it is COPS. Mon, Jan 30, 2012 : 12:45 a.m. I remember growing up being told that if I was lost in a crowd that I should find a policeman and ask for him help. I do not give that advice to my son. I don't trust cops. Instead, I tell him to find a mother with children. And, to approach her for help. Policemen have surrendered their place of trust and honor in society due to their prioritized self interest in pay, benefits and retirement. They have secured these benefits through unions and their ability to generate revenues at the point of a gun. Generally law abiding citizens are more likely to find themselves &quot;taxed&quot; by cops in traffic situations than they are to feel grateful in rescue from truly violent situations for which cops were originally constituted. Now we have SWAT units. Militarized police have become the norm. These are not trustworthy people. They are a danger to society and a leading indicator of American society's downward trajectory. We would be better off without the &quot;cops&quot;. Sat, Jan 28, 2012 : 4:16 a.m. I was taught that only cops called cops cop! Fri, Jan 27, 2012 : 5:25 p.m. I love this kind of etymologic article. Putting the words we use in historical context informs us and promotes good communications. Great job, Rich! But there's another context which influences the &quot;results&quot; of what we say. That is, the way we say things. Even the word &quot;Mom&quot; can be said in a sarcastic tone with a sneer. So unless one is already a criminal or wants to quickly become one: I think the terms &quot;cop&quot; or even &quot;officer&quot; should be uttered with care. Fri, Jan 27, 2012 : 3 p.m.
Fri, Jan 27, 2012 : 4:34 a.m. Very cool article. It would be neat to hear of some of your stories on CTN! Fri, Jan 27, 2012 : 2:29 a.m.
My father was a police officer in AA from mid-forties until early 70ies. I have never called a police officer a cop. It was/is a derogatory term. Yes, Officer? Was I speeding? Oops. Thu, Jan 26, 2012 : 10:38 p.m.
Fri, Jan 27, 2012 : 12:57 p.m.
That is a bad joke but now I'm curious about how &quot;pigs&quot; came to be slang for police officers. Thu, Jan 26, 2012 : 10:56 p.m.
Thu, Jan 26, 2012 : 9:51 p.m.
&quot;Within moments Spanky was blowing up my cell phone ...&quot; how many times did he call? Snopes' take on &quot;Constable on Patrol&quot; as origin of the word cop can be found here: <a href="http://www.snopes.com/language/acronyms/cop.asp" rel='nofollow'>http://www.snopes.com/language/acronyms/cop.asp</a>. Personally, I find Snopes' explanation to be more believable. Fri, Jan 27, 2012 : 3:57 a.m.
Yep, &quot;Constable on Patrol&quot; is a famous folk (i.e., spurious) etymology. Thu, Jan 26, 2012 : 9:49 p.m.
Thu, Jan 26, 2012 : 8:40 p.m.
Great column Rich. I always wondered where the term Cop came from. I too was taught as a child that the term &quot;cop&quot; was disrespectful and to always say &quot;police officer&quot;, and to this day when I encounter the police at work or wherever I still find myself hesitant to use the term cop in their presence. Thu, Jan 26, 2012 : 8:32 p.m.
Don't forget 'ham sandwich' - the term used by the NOPD for a gun they plant on somebody they murder! Thu, Jan 26, 2012 : 8:21 p.m. I was always led to believe it came from the copper badges. I should at one time calling an officer a Cop, Copper or Coppa (with an accent) was indeed derogatory. Only a few years ago I said Cop in front of my 90 year old Grandfather, he was never a police officer but he gave me a look like he could have smacked me or washed my mouth out with soap. He explained back in the day it was trash talk and only trashy people called Policeman cops. Thu, Jan 26, 2012 : 8:01 p.m. Interesting history lesson, Thanks Rich. And thanks to all our men and women in blue or brown as in the Sheriff's Dept. You do a great service and with little thanks.